This event was so successful last year....we're doing it again! 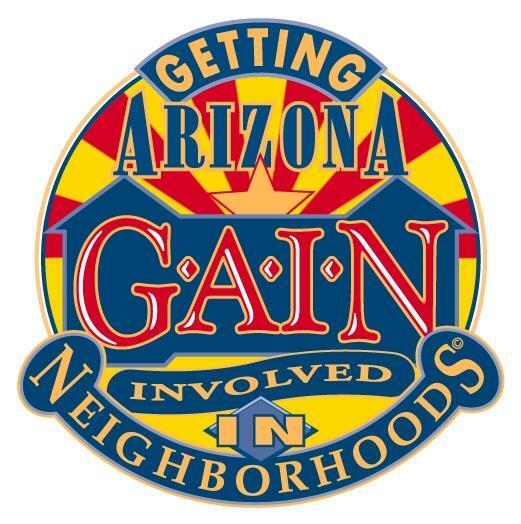 Your Precinct Program Officers, Communty Action Officers, Phoenix Police Special Assignement Unit alon with a variety of city departments, programs and local businesses will be on hand to answer questions and offer suggestions for creating successful G.A.I.N. events throughout the city. And, don't forget, G.A.I.N. t-shirts will be on sale from the Phoenix Block Watch Advisory Board. Other elements of the event include representatives from the Mayor's Office, City Council, the EZ Child Identification System to offer fingerprinting of children and seniors, McGruff the Crime Dog, and the Phoenix Fire Department...and the list keeps growing! Neighborhood groups and block watches are encouraged to register their events prior to October 1, 2014, in order to receive a "Crime Prevention" bag filled with prizes to take with them to their neighborhood G.A.I.N. event. G.A.I.N. is Saturday, October 18th, 2014! Register here! G.A.I.N. is also a day for the police to show their appreciation for those in the community that support our efforts in the day to day fight against crime. It's not too early to start thinking of ways you can help make G.A.I.N. a successful event. Register your GAIN event here!